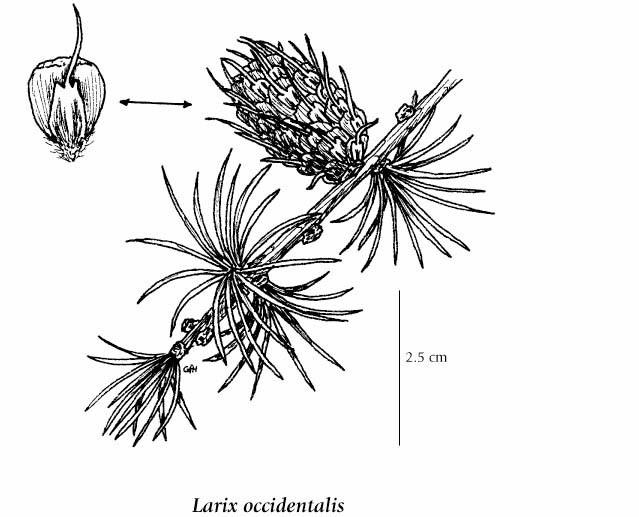 The western larch is unusual in that it is a deciduous coniferous tree that loses its needles in the winter. Large tree, up to 55 (rarely 70-80) m tall; bark thick, furrowed into large plates, scales cinnamon colored; young twigs glabrous to hairy, not woolly-hairy. Needles deciduous; pale green (yellow in the autumn); stiff; 15-30 per spur; 25-45 mm long; broadly triangular in cross-section. Seed cones 25-30 (35) mm long, yellowish-brown; pollen cones yellow, about 10 mm long. Moist to dry slopes in the montane zone; common in SC and SE BC; E to SW AB, and S to OR, NW MT, and N ID.